Several years ago The Brit treated me to a romantic birthday dinner. It was a complete surprise as to where we were going, I only knew that it was a French restaurant. On the way, I mused how delightful it would be to have a glass of Sancerre with my meal. He thought it would be highly unlikely. 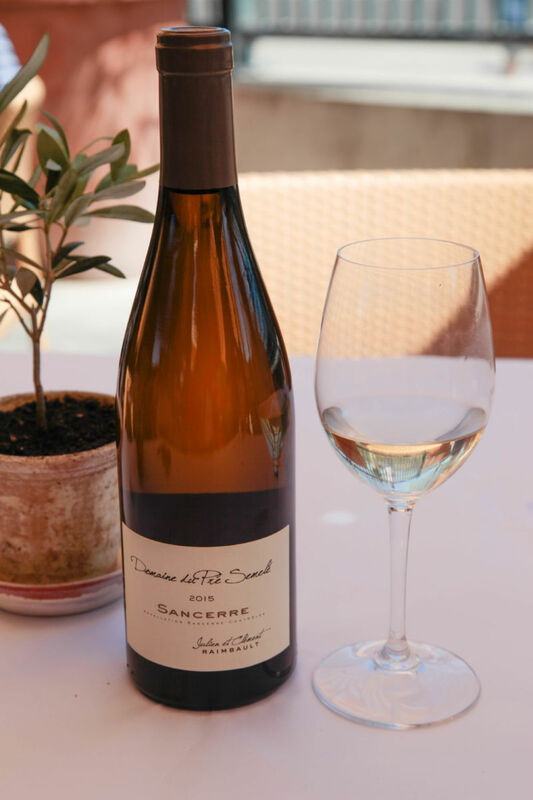 We not only had an outstanding meal that night, but I also got my wish for a glass of Sancerre with it. It was a perfect night. 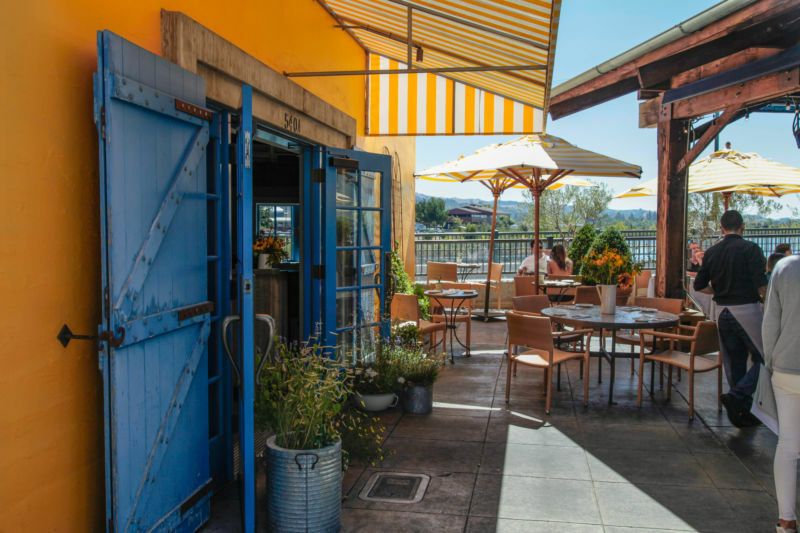 The restaurant was the beautiful Angele on the Napa Riverfront. I found myself dining at Angele for this birthday too, but this time at lunch and as a food and wine blogger. The one caveat I have for this review is that the restaurant was expecting us. That is not normally the case for our reviews. We were concerned that the service we received would be colored by the staff’s knowledge that we were writing a review. Our fears were, I think, unfounded. The Brit and I watched the tables around us and other diners were receiving equal attention and hospitality. That really put us at ease so we could write an honest review of our dining experience for this visit. The Brit comments: The service was efficient, informative, and unobtrusive. 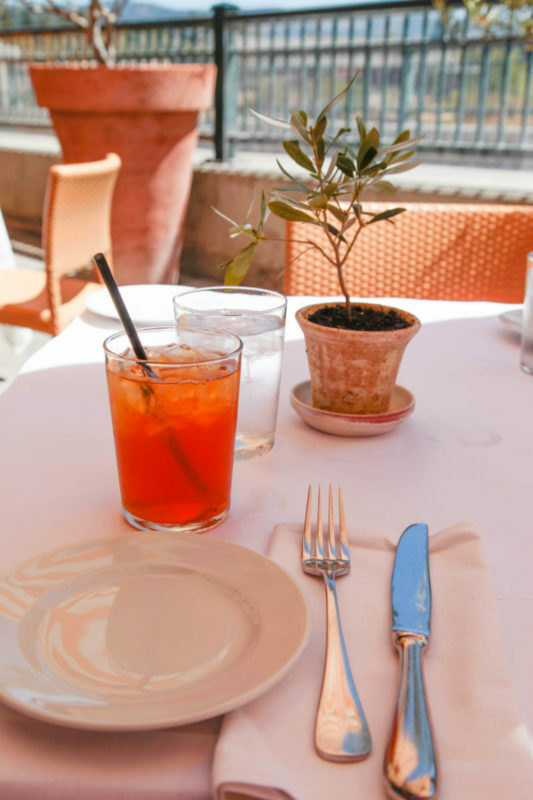 Our water glasses and California Girl’s iced-tea were refilled without prompting on our part or interruption from the waiters. 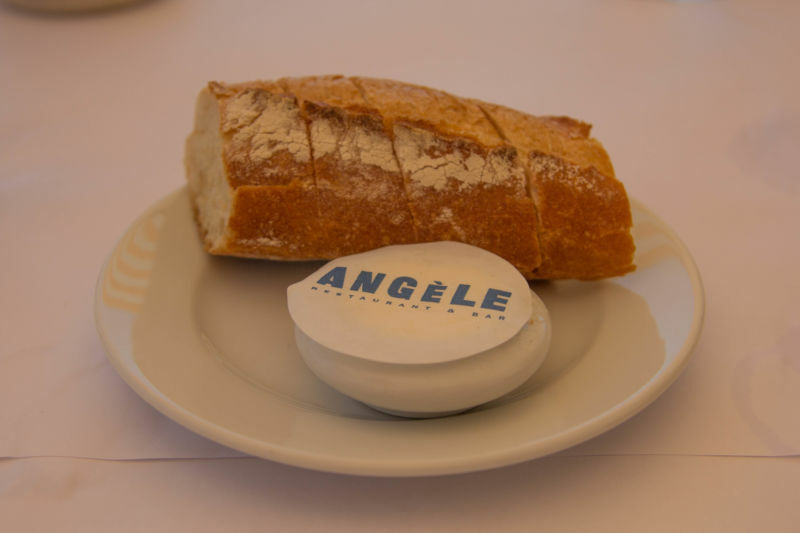 If you haven’t been to Angele, the restaurant is absolutely lovely. The patio overlooks the river and is both pleasant and charming. I could sit there all day and enjoy a few glasses of wine, the view, and people watching. It didn’t hurt that the weather was perfect. Everything looks even better in the sunshine. The Brit comments: The patio area is mainly shaded, mostly by a wooden pergola and the rest covered by yellow and white umbrellas. This makes the space comfortable even in the early afternoon on an August day. Our waiter was very efficient and brought menus and offered water and drinks very quickly. The Brit ordered a glass of wine and I started with iced tea. Wow, was I glad that I started with that. Why am I raving over iced tea? It was amazing. The tea they serve is called Sportea. It is naturally sweetened, has zero calories, and tastes great! I drink a lot of iced tea and having something that is this delicious without artificial sweeteners or sugar is a huge win. I have already ordered some to drink at home. The Brit comments: I ordered a glass of Burgundy wine: Monthélie Chateâu de Puligny. This was a classic European example of Pinot Noir, with bright acidity and subtle fruit tones. We ordered two starters to share. I ordered the Fromage du jour plate (cheese of the day) and The Brit ordered the steak tartare, of course. 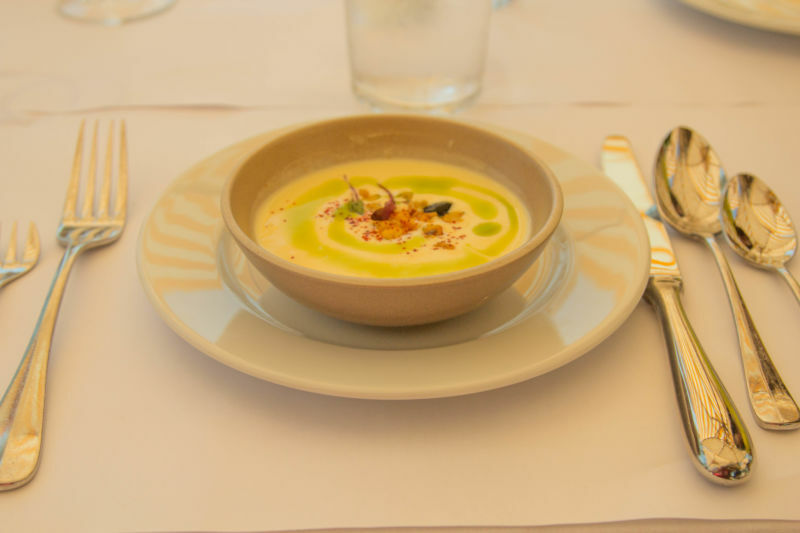 Previously, I had eaten both the cold corn soup and the roasted bone marrow. I enjoyed both but was looking for something new to talk about. 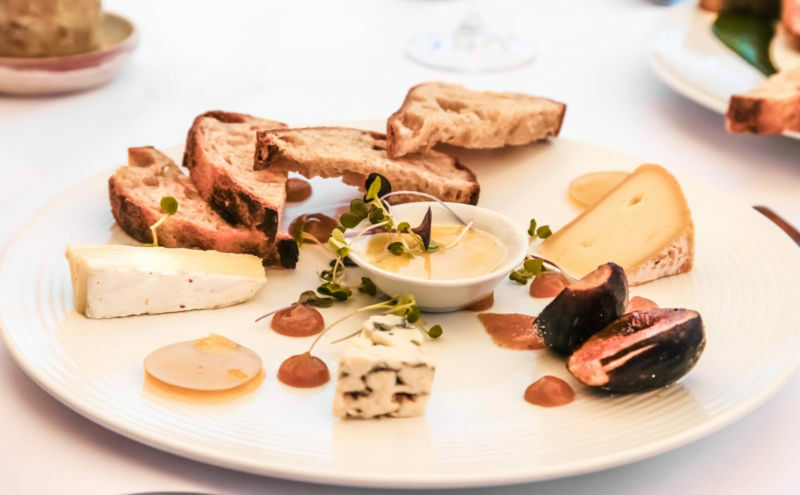 When ordering a cheese plate one thinks of a very simple dish. This cheese plate, however, was beautifully complicated and challenging to the palate; I loved it. The plate was presented to me and the cheeses were described. There were fresh figs, dollops of fig jam, creamed honey, and honey gelatin along with the cheeses. It was served with slices of a rustic shepherds bread. The reason I said that it was challenging to the palate was the addition of the Roquefort blue cheese. Looking at it, I couldn’t imagine the combining the blue cheese flavor with those of fig and honey. Usually, I can visualize flavor combinations before I eat them. In this case, it took me several mouthfuls to decide if I liked it or not. It had many discordant notes, but it won me over in the end. I sat and ate happily in the sunshine. Only afterward did I realize how well a glass of Sancerre would have paired with that dish. Darn it! I had asked the waiter to bring it with my main course. The Brit’s steak tartare was so beautiful, it looked like something worthy of the Food Channel. It was served on a pool of kale purée for a stunning visual appeal. 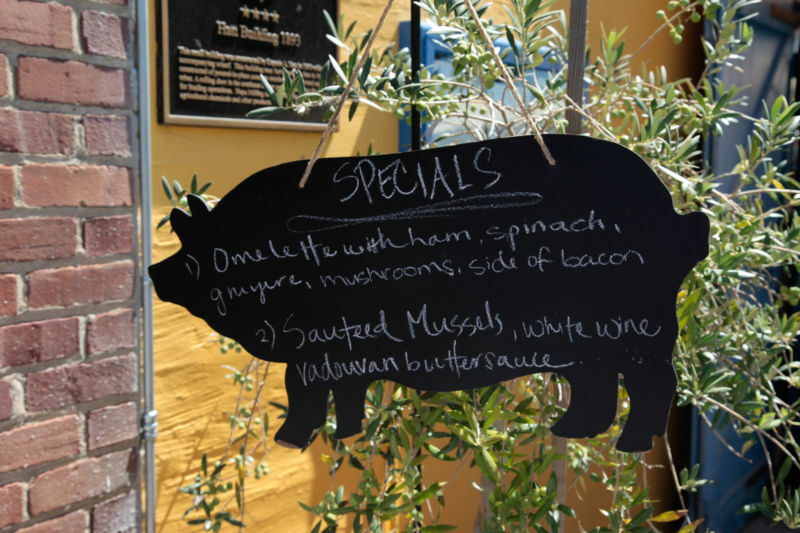 I sampled it along with a piece of the rustic bread with which it was served; I was wowed! The flavors were fresh, clean, and rich in the mouth. A total win. 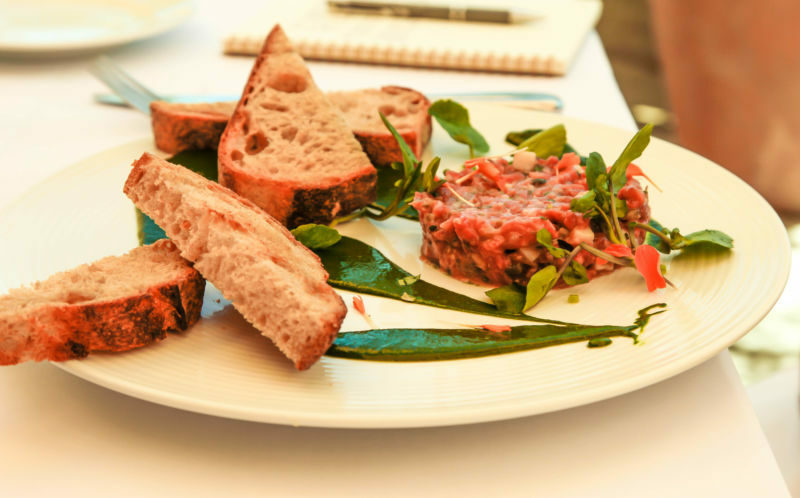 The Brit comments: The texture and flavour of this steak tartare were spot on. The mix of meat, onions, and capers resulted in a well-balanced seasoning that did not overwhelm the meat. The kale purée, which I had assumed was merely for visual appeal, added an extra layer of texture and flavour to the dish. The acidity of the wine did a wonderful job of cleaning my palate between mouthfuls. I think that was an even better version of the dish than I had enjoyed a few weeks ago at Bistro Jeanty. My glass of Sancerre had arrived at this point. I had ordered a glass of the 2015 Domain du Pre Semele. Priced at $12 a glass, I thought it was very good value. Unfortunately, it had cork residue in it. It was immediately replaced with a new glass by the waiter. He saw the cork as he set it down and whisked it off before I could even blink. The second glass too had cork sediment, so the waiter went back and opened a new bottle as the first obviously was having issues. I didn’t have to ask. I watched other people in the restaurant as they ate their food. Everyone seemed relaxed and happy with their plates, even sharing things that were particularly good with one another. That is always a sign of a great meal. When our entrées appeared again they were really beautiful. 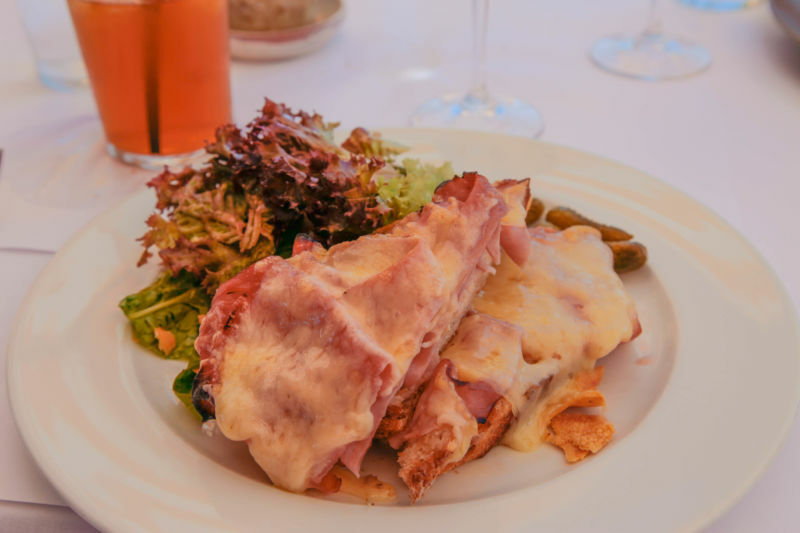 The Brit’s Croque Monsieur looked amazing. Oozing with cheese and piled ham, I started to salivate. My plate too was beautiful, but I was a little disappointed with the deep brown of the omelette; for me it was slightly overcooked. 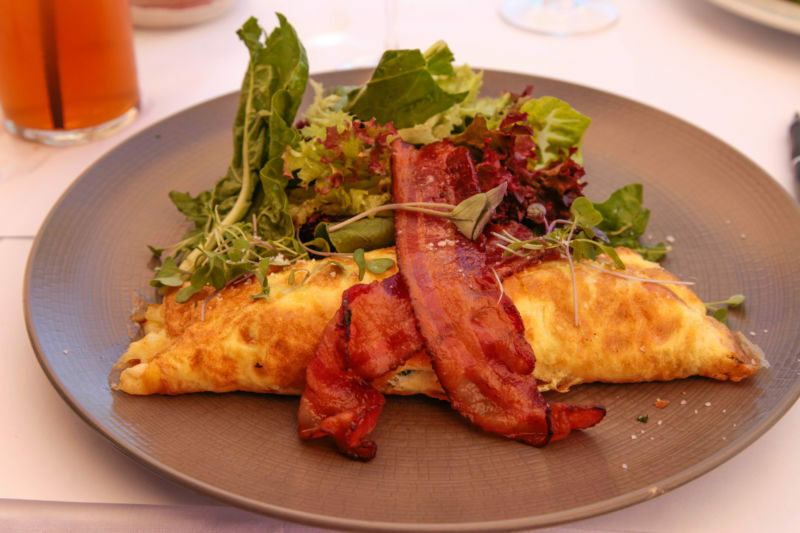 My omelet was stuffed with wonderful cheese, mushroom, and spinach. The flavors were great. The bacon was a particular joy. Not only was it cooked perfectly, but it had a slight maple flavor to it that I really loved. The salad garnish was fresh, but I would have preferred the dressing to have a little more oomph. The lettuce was dressed very simply in a European style with only olive oil and salt. This gave it a very savory flavor that was good, but I felt it needed to be a bit brighter or possibly sweeter with the rest of the dish for that perfect bite. The Brit’s Croque Monsieur was every bit as delicious as it looked. The ham and cheeses were so flavorful and I really enjoyed the subtle béchamel with it. His dish also came with the same salad as I had, and again I felt that there needed a bit of a sweet profile to counteract the saltiness of both the ham and the cheese. I am nit-picking though. The Brit comments: The bread had a thick crust with a definite crunch to it. The ham was juicy, with a slight hint of smoke. Melted on top was the cheese which was abundant and rich in flavor. The textural contrast of the three main elements made for a thoroughly enjoyable meal. By this time we both felt completely satisfied, but as we always think of our readers, we ordered dessert. Ok, so we weren’t all that self-sacrificing here. With a meal this good, dessert had to be amazing. People who know me, know I don’t eat much dessert. I am one of those that is happy with a spoonful of whatever to be satisfied. Even with the blog, it is rare I eat more than a bite or two of anything that is ordered. On this occasion, however, I ate most of my dessert and a couple of bites of The Brit’s. 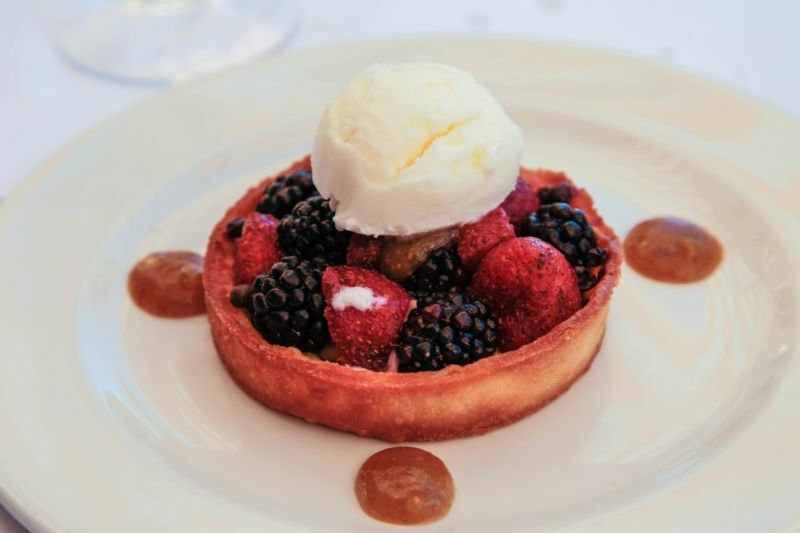 I ordered the berry tart. It had fresh berries on a crust of what seemed like shortbread. It was filled with a small amount of vanilla pastry cream. The entire combination was wonderful. I would have liked it if there were a bit more of the pastry cream, but what I had was great. The crust had so much wonderful flavor. I am going to try a version of this dish at home. It gave me ideas to play with. It was served with a small scoop of creme fraiche ice cream that was interesting and very lightly sweet. It was like the interior of a sour cream pie; that type of sour and slightly sweet combination that really works with berries. 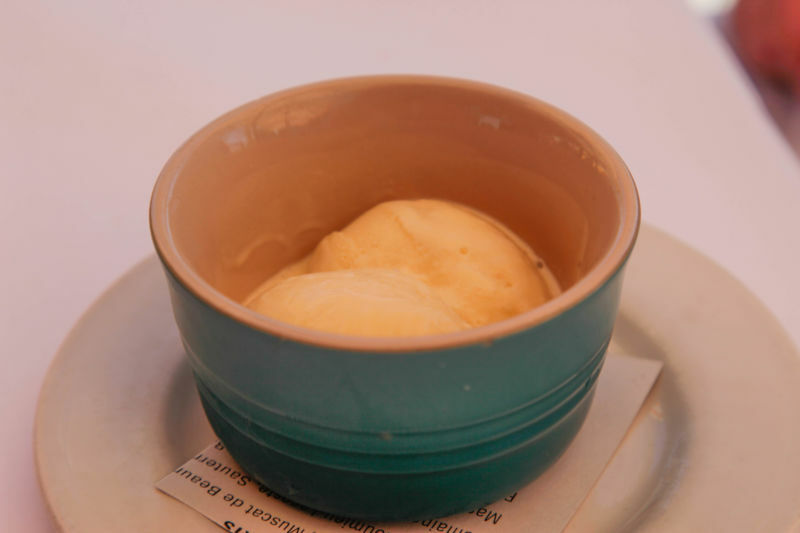 The Brit, always the ice cream fan, ordered the orange and cardamom ice cream. I just knew from the sound of it that it was going to be good. It wasn’t good. It was outstanding. I don’t eat ice cream. It always seems too sweet for me. This, however, was rich, creamy, and filled with wonderful flavors and the perfect amount of sweet. I wasn’t left with the taste of sugar in my mouth, but rather the gorgeous flavors of the orange and cardamom. I loved it. The Brit comments: The orange flavour reminded me of Grand Marnier, which is a good thing; less sweet than regular oranges – possibly Seville oranges. I love cardamom, but it is an ingredient that can dominate a dish. Here it was a subtle hint; an enhancement to the creamy well moderated sweetness. By this time we were both absolutely sated by the wonderful meal. We had big plans to make it to a downtown winery tasting room, but we were both suffering from food comas so we opted to go home and act like slugs instead. A perfect Sunday. GV Cellars Cabernet Sauvignon 2005 only $15 a bottle – Hurry!